same quote. I wear it every day.? Ebanks has harnessed her late father?s mantra to forge an enviable career in the publishing industry. She oversees Essence?s circulation, production, advertising and marketing departments, develops new magazines, such as the recently launched fashion book Suede, and evaluates acquisition opportunities in the market. Since Essence sold its remaining shares to Time Warner Inc. in January, Ebanks has been preparing for her new role as president of the company. Ed Lewis, Essence?s co-founder, chairman and CEO, calls the new partnership with Time Warner an opportunity for ?aggressively broadening the scope of the Essence brand and penetrating new markets around the world.? With Ebanks at the helm, the transition is expected to be an exciting one. Ebanks earned a bachelor?s degree in finance at the University in Florida then launched her publishing career at Knapp Communications, where she honed her financial and management skills at Home and Bon Appetit. After Knapp?s acquisition by Cond? Nast in 1993, Ebanks continued as the business manager for the publishing conglomerate?s 13 titles. 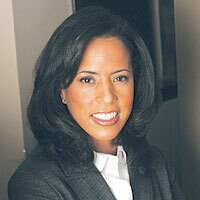 She subsequently joined Time Inc.?s Money magazine, first as general manager, then as vice president. At the same time, she was serving as president and CEO of the Institute of Econometric Research, parent company of Mutual Funds magazine, which Time acquired in 1998. With two sons at home, ages 3 and 1, Ebanks says her ?greatest challenge in life is [balancing] my devotion to them and the demands of my workplace responsibilities.? But with a supportive husband, whom she calls ?a tremendous source of . . . insight and encouragement,? and her father?s ?profound influence,? she considers herself well equipped to overcome any obstacle with perseverance, grace and a competitive spirit.